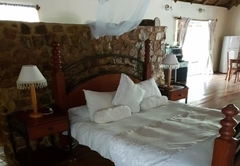 Out of Africa Lodge is a highly recommended property providing self catering in Hartbeespoort for tourists visiting the Hartbeespoort Dam region. Out of Africa Lodge is a beautiful lodge situated in a nature estate at the foot of the Magaliesburg mountains, close to Hartbeespoortdam. 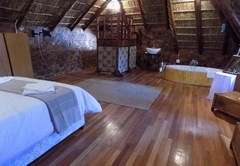 It is in the heart of the bushveld with beautiful trees, bird life and animals. There is a walking trail to the top of the mountain or you can enjoy lying in the sun at our pool. Come and enjoy our hospitality and unwind in the bush. 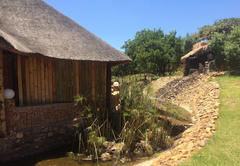 Out of Africa Lodge is only 45 minutes drive from either Johannesburg or Pretoria and even Sun City. 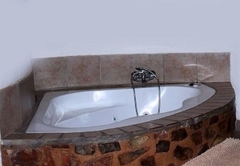 Featuring 8 Ndebele self catering chalets which accommodates 2 people with a divine Jacuzzi bath ideal for some R&R. 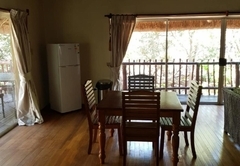 2 Family Self-catering Chalets sleeping 6 people in 3 bedrooms with 2 en-suite bathrooms . 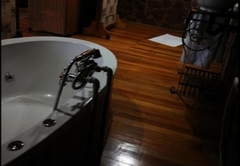 The Private Penthouse and Tree House Suites both feature Jacuzzi Baths situated high up on the mountain side these units are ideal for a romantic getaway. 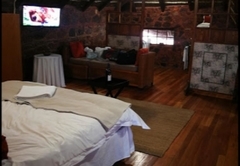 Boasting individual sleeping units, offering guests the comforts of home, while experiencing the ruggedness of true bushveld. Imagine lying back in a soothing spa bath - imagine no more. Built on a rocky outcrop, Out of Africa Lodge is the ideal place to enjoy a serene, romantic weekend or a fabulously indulgent getaway - however you fill your day, it begins and ends in indulgence - just because you can. Wake up to noisy Franklin and Guinea Fowl and early morning greetings of inquisitive game on your doorstep or go for a walk in nature and discover the spectacular bird life that are found on the estate - then relax on your patio and sip sundowners while watching the magnificent sunset. Self catering chalet suitable for 2 , does not have a bath but does have a shower. Open plan Suite with jacuzzi bath. Tea/coffee tray. DSTV. Non self-catering. 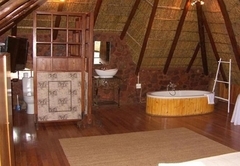 Penthouse Suite with Queen Bed and en-suite private Jacuzzi bath.DSTV. Tea/coffee tray. Safe parking. Mountain views from private balcony. Not self-catering. 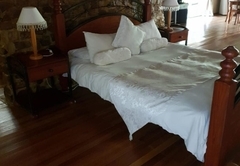 2 Bedroom Cottage, 1 room with queen bed, 1 with 2 x single beds, Bathroom with Shower. Lounge. Self-catering Kitchen. Private Braai area. DSTV. Safe parking. Open plan Chalet with jacuzzi bath. Kitchenette. Private braai lapa. DSTV. Fully equipped for self-catering. 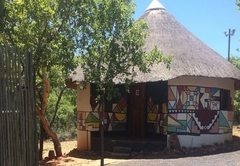 Our Ndebele chalets can sleep 2 adults on a double bed; this is an open plan chalet with a Jacuzzi bath, an outside braai area and the chalet is self catering. We had a pleasant stay. The staff was friendly and helpful. Will definitely visit again. Response timeOut of Africa Lodge typically responds to requests in 5-10 minutes.